Everything Jude Buffum does and makes is inspired, but these 3 pieces for the upcoming 3G Show (Gremlins, Goonies, Ghostbusters) at LA’s Gallery 1988 absolutely take the, uh, the Zuul. Each of Buffum’s movies-as-8-bit-video-game has already been making the rounds on Tumblr and Reddit today—although, to be fair, I first saw these at .tiff—but they are well worth reposting. So here they are again! 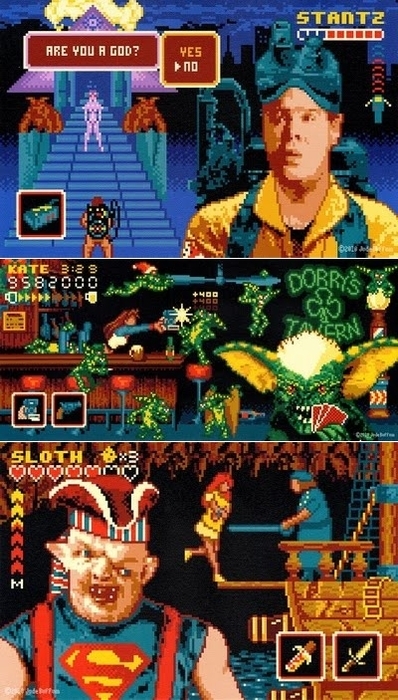 I especially like the direction Buffum took in his rendering of Gremlins as a 2D platformer: as in the movie, Kate is holding the gremlin threat at bay with flash photography. It’s very Fatal Frame, isn’t it? I would totally play that 8-bit game! If you happen to be in Los Angeles this fall, I definitely recommend that you pick up some of Buffum’s limited-edition prints and, you know, mail them to me. The exhibit opens September 3rd and runs through the 22nd. Also, if you happen to be in San Francisco right now, I definitely recommend the current solo show at Gallery 1988 SF, as it is all collage work by the Chicago artist who moonlights as Rotofugi Gallery’s curator. I think I’m obligated by law to mention that.